The Christchurch Priory Through 900 Years Saxon and Norman: 7th Century AD to 12th Century The Anglo-Saxon Chronicles record that in 634AD Birinus, a missionary priest sent by Pope Honorius landed in Britain and in 635 baptised King Cynegils of Wessex. It was thought that he might have founded a Saxon Priory at Thuinam as a base for his work in this area, as part of the Pope's general plan to re-introduce christianity to Britain. (Thuinam near a fine harbour and at the confluence of the Rivers Avon and Stour would, in those times, have provided sea communications as well as access to an extensive hinterland by the two rivers, which in the case of the Avon was navigable as far inland as Salisbury). There is no specific evidence for this, however, but it is reasonably certain that there would have been a church here in the 9th century when Thuinam was sufficiently important to be included in King Alfred's list of fortified boroughs. The Domesday Survey of 1086 records that there was a Priory of 24 secular canons here in the reign of King Edward the Confessor (1042-1066). In 1094 Ranulf Flambard, a chief minister of King William II (Rufus) began the building of a Norman church on the site of the old Saxon Priory. A paragraph in the Christchurch Cartulary (1312-1372) states: 'Flambard (the Norman founder of the present Church) destroyed the primitive church of that place and nine others that had been standing below the cemetery. The nine others probably referred to nine individual monastic cells grouped around the main building. By now the Priory possessed extensive lands, manors and halls in Hampshire, the Isle of Wight and Dorset, but it was often ill served by its secular canons, who were often drunken and dissolute. 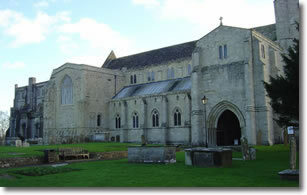 In 1150 Baldwin de Redvers, Lord of the Manor and Earl of Devon, in conjunction with his son and heir Richard de Redvers and influenced by Henri de Blois, Bishop of Winchester and brother of King Stephen dissolved the secular Priory and reconstituted it as a Priory of Canons Regular (i.e. ordained) of the Order of St Augustine of Hippo (North Africa) and by charter (a facsimile ofwhich is on display in the Nave) granted it the freehold of the land on which it was built. Reginald was elected the first Prior. 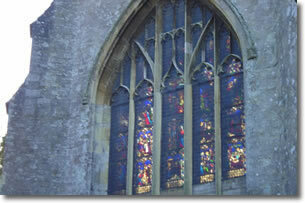 Christchurch and the Priory were most fortunate in their landlords and patrons. The de Redvers, Earls of Devon, in particular followed an enlightened policy as regards feudal dues and customs for nearly 200 years. The last of their line, lsabella de Fortibus, Countess of Devon, owned extensive estates in the south of England. It is said that she was persuaded on her deathbed in 1293 to sell her eastern estates in the Isle of Wight, Hampshire and Dorset to King Edward I for 6000 silver marks (£4000). Christchurch thus became a Royal Manor and in 1303 had to provide and man a ship to aid the King's campaign against Scotland. In 1330 King Edward III granted the manor to Baron de Montacute who became the 1st Earl of Salisbury (Second Creation). It is a coincidence that this Salisbury line also ended after some 200 years with a woman, Margaret, Countess of Salisbury. The South Nave Aisle windows are in the Decorated Gothic style as is the quire screen, although it is probable that this screen was brought in from elsewhere at a later date.